Celebrate Valentine's Day in a fun and feel-good way: at the movies, watching Big, an oldie but goodie Tom Hanks flick that celebrates love beyond the classic Romeo and Juliet story. One hundred percent of ticket proceeds will go towards supporting the local ALS (aka Lou Gerhig's Disease) Foundation, which looks to find a cure for the terminal, neuro-degenerative disease. 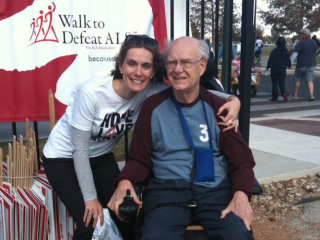 The event is organized by Jennifer Slaski Halligan, whose father (pictured here with Halligan) died of ALS and whose birthday was on February 14.